Tlaxcala (pronounced tlash-KAH-la) is the smallest state in Mexico, but it is one of the most important in terms of Mexican history. The Tlaxcaltecans were defeated by Cortés when he arrived there late in 1519, but eventually chose to ally themselves with him in order to defeat the Aztecs. 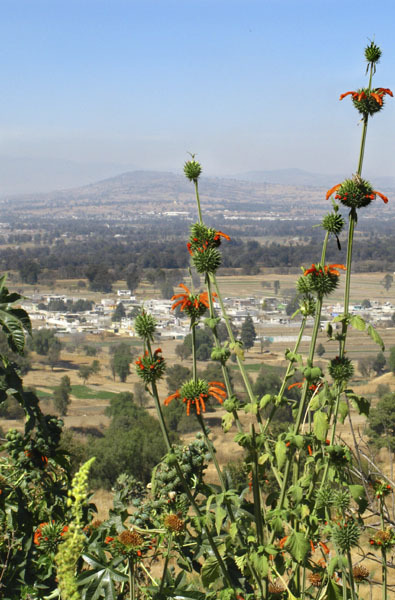 Tlaxcala was one of the few regions in Central Mexico that was not controlled by the Aztecs, but the Tlaxcaltecans knew it was only a matter of time before the Aztecs decided to invade. The state of Tlaxcala is one of the few areas that was never despoiled by the Spaniards, though the population was eventually ravaged by imported diseases. Cortés founded the city of Tlaxcala sometime around 1520 on land donated by two indigenous peoples. It was the first city he founded, and the church he built there in 1521 is the oldest in North America. The city sits at the foot of the La Malinche volcano, at an altitude of approximately 7400 feet (2277 meters), and on its eastern horizon can be seen two other volcanos--Popocatépetl and Ixtaccihuatl. It had a population of 15,777 at the time of the 2005 census. Sybil and I found Tlaxcala to be a lovely place to visit in January. It gets pretty chilly late at night and early in the morning, but the sun shines during the day and warms things up very nicely. The central city is quite lovely, with many old colonial buildings. The Tlaxcaltecans seem to sweep the streets and sidewalks continuously, keeping the city clean and neat at all times. Please click on the photograph below to start the photo tour, which will launch in a new window. This photograph shows the view looking East from Cacaxtla. sits at its base, but cannot be seen directly from this point.